My Grandfather brought these photographs home from the war. I am told that he was friends with Ernie Pyle. The famous World War II journalist. Grandma had the photo album hidden away in her house. She was afraid that something might happen to them. I think they are a treasure and should be shared. Fortunately, back in 2001 she let me borrow them long enough for me to scan them. I have wondered at a means of sharing them. Now that I have a blog, this is the perfect vehicle for such an endeavor. I’ll bring them out in categories that seem logical. The Bomb. The treaty. The people of Asia. The Soldiers. These are pictures of the bomb. One of them. Exploding over Nagasaki or Hiroshima. A terrible decision that saved American lives. Possibly millions. But ended hundreds of thousands of Japanese lives and affected the next generations terribly. War is a terrifyingly, wretched endeavor. It is my suggestion that, after you have scanned all the images for your personal use you contact a museum. These may well be – since I’m unsure if there are other copies – incredibly significant historical documents. Kudos for posting them. I look forward to more. The bomb saved millions of Japanese lives as well. An invasion of the home islands would have killed millions. The civilians were being trained in suicide tactics to repel the Allies. A regretable but wise decision considering Japanese ideology at the time. I agree with you Cuz’n. From all that I have read, the Japanese were prepared to fight to the last man in every village, city and province. The dead from such a campaign would have been on a scale not seen in the annals of history. I agree..if you read the book called “war in the pacific”, it explains the Japanese war mentality of that time. Not just American troops, they also tortured and killed a significant amount of troops from Indian subcontinent, who were at that point fighting for British Indian army…As bad as it sounds, this bomb did save lives on all sides. The bomb may have also saved your grandfather life as he was part of the US Army invasion force station off of Japan in a ship. I wish I knew the name of the ship he was on. Incidentally. When I first scanned these photos, I contacted a couple of museums. None of them returned my calls, emails or letters. Ernie Pyle was a journalist, not a photographer. He spent most of the war in North Africa, Italy and Europe. He was in the invasion of Okinawa and killed not long after by a Japanese sniper on Ie Shima, another island near Okinawa. These photos were probably produced by the thousands and given to servicemen. 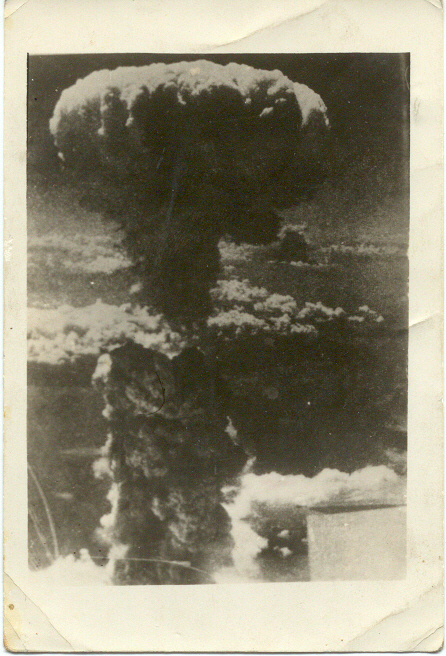 The atomic bomb mushroom cloud has been seen numerous times in books and magazines. They were taken by one of the B-29s that accompanied the Enola Gay on the mission. The photo of the burned Japanese body has been published before. Japanese and American military and civilian photographers photographed much of Hiroshima and Nagasaki after Japan was occupied. I have been studying WWII literally all my life, and started a publishing business in 1968 while still in high school, to publish a WWII history magazine. Apparently I jumped the gun because it didn’t become successful enough and I switched to publishing books and soon after they started publishing World War II Magazine. I have over 120 books in print now, mostly WWII histories and memoirs (I’ve recently added Vietnam and Korean War titles). One of the authors, a veteran of the 9th Infantry Division, had a set of photos showing various scenes from his unit’s wartime service that had been given to them at the end of the war, thus my guess that these are a similar set given to your grandfather at the end of the war. I have a bunch of other photos of my Grandfather and his fellow GIs and a with Japanese folks. There is also a pic of a guy with elephantiasis. in life. He was such a good man. Always concerned about his family. I miss him so much. Thank You.